A teenage pusher (Scott Marlowe) straight out of reform school gets his friends hooked on marijuana, with disastrous results. 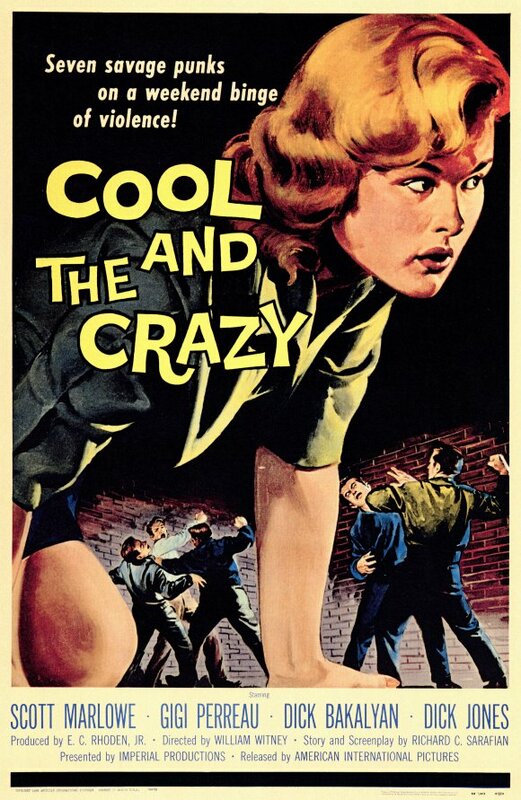 This laughable juvenile delinquent flick — Reefer Madness for the ’50s crowd — perpetuates the myth that marijuana (“M”) is instantly addictive, and will immediately reduce its users to a life of crime. Like the similarly themed High School Confidential (released the same year), The Cool and the Crazy centers on a “new kid” in high school who turns out to be a negative influence on his classmates — but at least Confidential had the guts to make its drug of choice heroin (a truly scary and addictive substance). The one redeeming feature of Cool and Crazy is the lead performance by Scott Marlowe (who would later star in 1961’s A Cold Wind in August). His movie career didn’t really go anywhere, but this role showcased his potential for becoming a latter-day Jimmy Dean. No. While inexplicably listed in the back of Peary’s book as a Sleeper, a Camp Classic, and a Personal Recommendation, it’s not must-see viewing. First viewing. A sleeper? ; no. A camp classic? ; no. A Peary personal recommendation? ; why? Certainly not a must. Marlowe, the only actor of interest here, did show potential for film in “A Cold Wind in August’ (he moved to a considerable tv career) — here he seems to have been instructed by so-so director Witney to sit through “Rebel Without a Cause’ ten times and treat “C&C’ as an equally important film. Uh-uh; it ain’t. Film fanatics will be disappointed to find zip in the department that makes “Reefer Madness’ a laugh-fest. “C&C’ is too earnest. Camp value (marginal) pretty much rests with the high school English teacher’s apparent obsession with the subjunctive mood. At 70+ minutes, this is endless.